If you are interested in signing up for lessons, please email and I will send you my unique URL and you can begin the National Registration process online. ISR will send you an email once the registration process is completed. This email will have your registration form and BUDS sheet, which are to be brought to your first lesson. Registration: For all new students, there is a one time national enrollment fee of $105 which will cover the cost of a comprehensive health screening procedure to assess the physical and developmental readiness of your child by trained medical professionals . This fee may be paid online when you submit the National Registration form. If there is anything the Registration Evaluation Team (RET) needs to follow up with you about, they will contact you directly. Within 5 days you will receive a package in the mail. 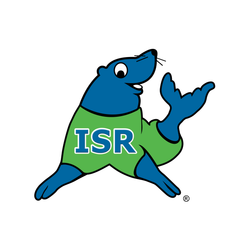 It will include a coupon code for the ISR Seal Store (www.isrsealstore.com) to redeem your child's ISR t-shirt and swim diaper (if necessary), as well as an informational DVD and your copy of the Parent Resource Book. It is very important that you read the PRB carefully, as it contains valuable information regarding lessons, food restrictions and pool safety. To register your child please email b.anderson@infantswim.com to discuss available swim times and for the link to complete the online registration. Refresher Lessons: The ISR National Registration Update fee is $35. Children grow and develop rapidly from infants to toddlers and young children. This development process represents improved strength, coordination and a more finely tuned cognitive ability. In accordance with this growth, children enrolled in ISR return periodically to participate in Refresher Lessons. These lessons are designed to fine tune your child's existing Self-Rescue skills to meet the demands of their growing bodies. Please contact me with any questions about the fees or if you require financial assistance. ISR's goal is to prevent drowning and through the Community of Caring, we offer lesson fee assistance to families in need, to ensure no child is prevented from enrolling in lessons due to financial need.